Hurricane Hoops - Thoughts and Reflections on the X & O's and Art of Basketball : Practice….We're Talking About Practice! In the true spirit of Allen Iverson, I, too, will admit that as a player I absolutely HATED practice. Bring on the games coach…I just want to play! 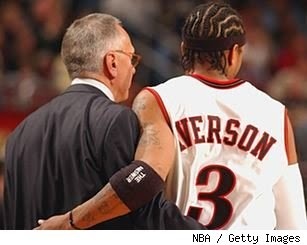 But now, that I am older and a coach, I am like Iverson’s practice-adoring nemesis, Larry Brown. I absolutely LOVE practice. I love trying out new drills, I love working out new plays. Practices can never be too long for me. With my new love of practice, I’ve come to realize that a coach needs not only an overall coaching philosophy, and a team building philosophy, but a coach needs a philosophy about practice too. 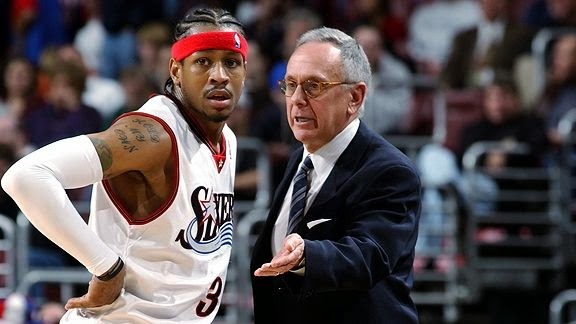 So with a nod to Allen Iverson-Larry Brown’s sometime contentious relationship in regard to practice vs. play, here are some notes I found along the way that I believe will help to shape a philosophy for practice. Every drill should have a name. I like to name my drills after the source I got it from (i.e. Gator Passing Drill from Billy Donovan & University of Florida, or Spider Fastbreak Drill from the University of Richmond). Each drill should be multi-purposed. Perform drills at the full-court, ¾ court and ½ court level. Stress to players the importance of execution of drill to game situations. Drills require imagination and concentration. Players don’t like drills, so the coach must sell the value of drill work. All drills must be competitive. Drills should be timed (use score clock). Build a portfolio of drills that specifically relate to your system of play and fundamental concepts. Stress enthusiasm…be very vocal…let them know you are watching. Hold each player to your highest performance standard. Each drill should relate to the coach’s system of play. The biggest challenge for a player during drill work is to consistently concentrate on performance. Every drill must be placed at the most advantageous time during the practice period. New drills should be introduced early in practice period while the player’s concentration level is still high. Combine as many fundamentals as possible into drills even though emphasis may be on one only. Use small carefully organized groups of 3 to 5 players for teaching purposes. Take notice that each player will not require the same amount of work (or attention) on each fundamental. Be demanding!!! Demand correct execution of basic skills. Express your expectations of each drill at the start...set the tone…don’t compromise your standards. Explain how the drill relates to the offense, defense, etc. Help each player understand the bigger picture. Coaches are teachers…drill work requires constant teaching. But again, I’ll add, don’t over-talk it! Guard against ending practice with an activity that causes players to feel they are being punished. Conclude each practice with a drill that players enjoy. Whenever possible coaches and players should exit practice with a positive feeling. My little quirk is that all practices end on a made shot. (whether it’s to end a scrimmage or concludes a foul shooting drill). Explain why drill is being performed. But I’ll add my own key point…don’t over-talk it! Some coaches love to gab. Have players run the drill at half speed. Allow players to perform drill at game speed. Allow for more variety while maintain emphasis on the same subject matter (i.e. offense, defense, rebounding). Gives assistant coaches the opportunity to teach. What I am going to teach. How I am going to teach. Why I am going to teach.